My coworker Jen recently got some disconcerting health news about her brother. Tests are being run and naturally minds are running wild. I really admire her positive attitude despite the circumstances and have been keeping her in my thoughts. Sometimes, its nice to hear from someone else that it’s just not fair. I am so sorry to hear of your brother’s recent health news. I can only imagine the roller coaster of emotions you and your family must be experiencing. Please know you are all in my thoughts. And if there is anything I can do to help, I hope you will ask. This kind of thing is never fair, and all I can say is I am so sorry. I know your brother is so lucky to have you in his life, supporting and cheering him during this difficult time. And I know it can be exhausting buoying the spirits of others when you’re experiencing the same fears. 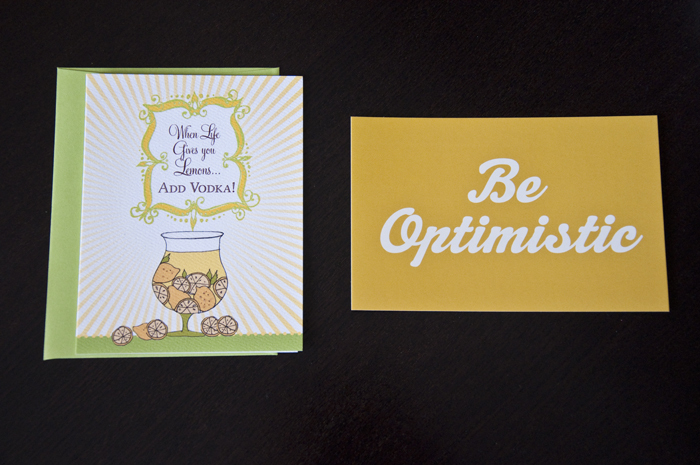 As such, I’m enclosing a little Be Optimistic post card for you to use at your discretion. Hopefully it will give you a much deserved day off, at the very least. P.S. Make yourself a drink!